FOOTBALL IS IN THE AIR — The Washington Blue Lions held a 7-0n-7 passing scrimmage against the Huntsmen of Huntington High School Wednesday morning, July 12, 2018 at the WHS practice field. Above, senior Richie Burns (6) goes up to make a catch for the Blue Lions. Washington will have a scrimmage at Goshen Saturday, Aug. 11 at 10 a.m. There will be a jamboree at Amanda-Clearcreek Friday, Aug. 17 at 7 p.m. The Blue Lions open the 2018 season Friday, Aug. 24 at Blanchester. They will have their home-opener Friday, Aug. 31 at 7 p.m. against Circleville at Gardner Park. 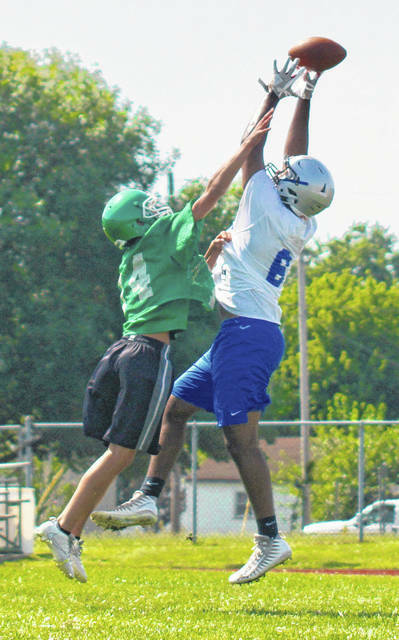 https://www.recordherald.com/wp-content/uploads/sites/27/2018/07/web1_Richie-Burns-catch-7-on-7-July-12-2018.jpgFOOTBALL IS IN THE AIR — The Washington Blue Lions held a 7-0n-7 passing scrimmage against the Huntsmen of Huntington High School Wednesday morning, July 12, 2018 at the WHS practice field. Above, senior Richie Burns (6) goes up to make a catch for the Blue Lions. Washington will have a scrimmage at Goshen Saturday, Aug. 11 at 10 a.m. There will be a jamboree at Amanda-Clearcreek Friday, Aug. 17 at 7 p.m. The Blue Lions open the 2018 season Friday, Aug. 24 at Blanchester. They will have their home-opener Friday, Aug. 31 at 7 p.m. against Circleville at Gardner Park.